Platform Height- Elevated - 26 ft. Platform Height - Lowered - 49.5 in. Platform Railing Height - 43.3 in. Platform Size 44 in. x 98.5 in. Overall Height 7 ft. 8.8 in. With Rails Folded 6 ft. 5.5 in. Overall Length 8 ft. 2.5 in. Wheelbase 6 ft. 10 in. Capacity on Platform Extension 250 lbs. Gross Vehicle Weight* 4,770 lbs. Turning Radius (Outside) 95.1 in. Tire Size, (Non-Marking Solid) 16 in. x 5 in. 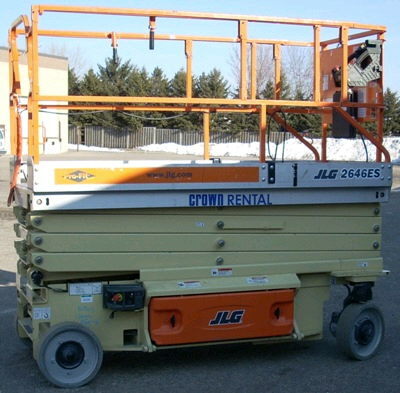 * Please call us with any questions about our sizzor lift 2646es rentals in Burnsville MN, Rosemount MN, Apple Valley, Minneapolis, St Paul, Twin Cities, South Metro,and Dakota County.